Clarence Gagnon's first sojourn in Paris was from 1904 to 1908, and from April to May of 1904 he took a trip to Spain, exploring Burgos, Madrid, Seville, Córdoba, Granada and Toledo. While in Madrid, Gagnon made frequent visits to the Museo del Prado to see the works of El Greco, Titian, Jan van Eyck, Francisco Goya and, of particular interest, Diego Velázquez. 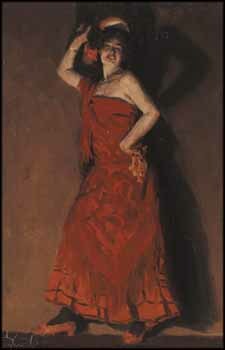 This spirited painting of a Spanish dancer was likely executed on the spot. Spain is known for flamenco, and here Gagnon captures the passion of this dancer with a palette of sumptuous reds, oranges and golden skin tones. Lit from below, her shadow cast on the wall adds emphasis to her dramatic pose. This work is the preliminary study for the painting Danseuse espagnole, in the collection of the Musée national des beaux-arts du Québec, which was first exhibited as Olé! at the 1906 Salon of the Société des artistes français in Paris. In Danseuse espagnole, Gagnon added guitar players in the background, but in this work, the dancer is the entire focus - exotic and sensual, she is mesmerizing.